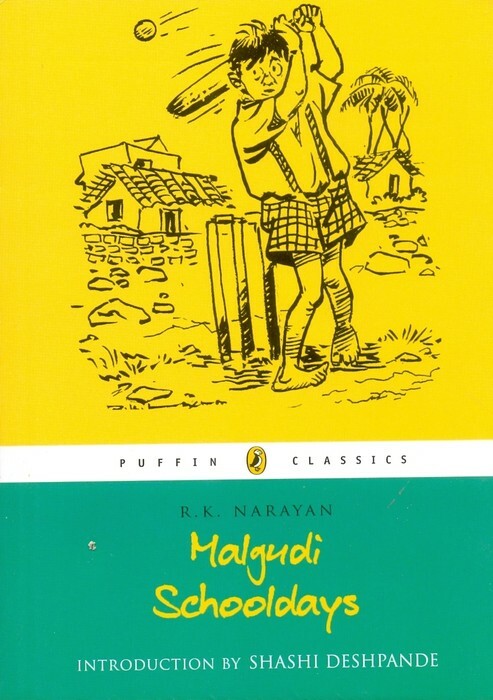 Malgudi Schooldays was actually published as ‘Swami & Friends’ first when R. K. Narayan first wrote the stories of his child character Swaminathan & his adventures. Most of the time we love to read books similar to our own lives & about people just like us. That’s why many school stories & novels are popular. R.K. Narayan, the creator of the character Swami was well aware of this fact & so penned the adventures of a boy in Malgudi. There is however, a stark difference between the school boy Swami & other foreign & well-loved schoolboy characters. Swami is fully Indian & his story is set before India had won her Independence. However, certain childhood fears & preoccupations we notice are common in both the early 20th century Swami & even todays 21st century kids. E.g., the fear of examinations & rival boys etc. I doubt that the pre-Independence Swami however will ever go out of fashion. This is a character who lives on despite changes in technology…because this character is real & very genuine. All the characters in this book are completely real although technically speaking they are ‘made up’. But lets get to the bottom of R.K. Narayan’s ‘Malgudi Schooldays’. Most of us who love reading already know that the south Indian town mentioned in this book is fictional & does not really exist just the way Narnia does not nor Camelot. This town where Swami & his friends stay was created by Narayan for the purpose of literature & adventure. It is here where we are introduced to a boy called Swami (Swaminathan) who is mischievous & has a mind of his own. He like most of the school going children today does his homework at the last minute & incurs the wrath of his teachers as well as his principal (principals) which gets him into a lot of trouble at the home front as well. Like all school going children, he belongs to a group of friends who he associates himself with just the way you associate yourself with the group of friends that you belong to. His two greatest associates are Mani & Rajam the latter who is from an affluent household. Mani on the other hand represents the ruffian of the group who has more brawn than brain but towards the end of the book, becomes diplomatic & quite wise in a way (he makes Swami think that Rajam will write to him to make Swami feel better). Rajam the police superintendent’s son on the other hand, enters the plot as a very proud & headstrong character but who never lets his wealth go to his head where his friends are concerned. He is partly generous (he gave Swami a green toy engine from his cupboard) & also is a person to mend broken friendships (it was in his house that all the friends of Swami puts aside their issues & befriend each other once again). In Swami’s family we meet many formidable characters who are immortal not only because of R.K. Narayan but also because, we see such people in our own homes or families. The family of Swami consists of his over indulgent mother (who nags the husband), a strict father & a very forgetful & meek grandmother who gives into whatever Swami says blindly. Swami father runs the show in the family & is often the cause for Swami getting into a lot of trouble. It is well enough to note that R. K. Narayan himself had a father who was equally strict with the members of his household & an indulgent mother. The grandmother however, captured my interest the most. The reason for me being interested in the activities of the old grandmother is because of the way she is so important to the main character Swami without him realizing it (well, until his father makes him sleep alone in his office away from the grandmother). He sleeps with the grandmother, the grandmother tells him stories about the great warriors of India & she is the one who gives Swami a listening ear in the whole household. Note that R. K. Narayan also in the first formative years of his life was brought up by his grandmother (mother’s mother) who had a great influence in his life. Swami’s mother throughout the story keeps herself quite distant from the boy (but cries for him when he gets lost) while Swami’s father has a military disposition in the bringing up of his son & never interferes with him. Till the end of the story we see that Swami holds a lot of ill feeling towards his father & his father’s behaviour is not at all what one would call, compassionate. There is yet again a similarity between Narayan’s own father & the father of Swami. There is always a bit of a funny bone in Narayan which also shows itself in this work especially during the legendary Satyagraha against the Albert Mission School where Swami takes a substantial part in & breaks the glass of the principals ventilator. He is also told to throw his cap into a bonfire which is first thought to be of foreign make but which in the end turns out to be quite Indian. The whole purpose of Gandhi’s Satyagraha is warped here in the story where violence takes place among the protestors & no one knows the difference between Khadi & foreign cloth. Although we get morals like bravery, friendship, loyalty etc.from the narrative, it’s the narrative itself that gives the reader pleasure beyond comparison. It acts like a mirror for youngsters to see their reflection & also gives us a glimpse of the corruption in the education system. Religious fanaticism is brought out through the unstable personage of the teacher Ebenezer but Narayan takes on this topic in his usual elementary manner without really hurting religious sentiment but showing us that religious fanaticism comes not from wisdom but, ignorance. On the whole, I appreciated this work especially the additions of two stories from the actual ‘Malgudi Days’ which are masterpieces in their own right. Swami is a character who can evoke in us the unsureness of childhood & its highs & lows. All in all, a really good read for the weekend.